Olive trees need lots of room to grow. 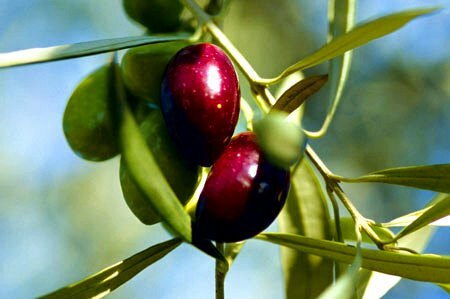 The best olives for oil come from low growing trees, which need a lot of room and sun so that the fruit can mature correctly. If it is a traditional olive grove there are only about 35 trees per acre in order for each tree to receive sufficient moisture and nutrients from the soil. Only horse manure is used as a fertilizer, watering is carried out sparingly. Volume producers cram many more trees per acre, for high production and ease in harvesting by machine. They use chemical fertilizers. The olives need to be harvested by hand. Only fully ripe, undamaged olives are suitable for the very best oil. Split, unripe or over-ripe olives reduce the fruitiness of the oil and contribute to its bitterness. Following a thousand-year tradition, men knock the branches of the olive tree with long sticks, in a process called vareo. (You can see a woodcut of this process on the Señorío de Vizcántar tin). The ripe fruit falls into nets that have been spread out at the base of the tree. To produce some of the very finest oils, each olive is picked by hand. Mechanical means are never used for quality olive oil because they bruise the fruit and hurt the trees. Windfall olives that are usually overripe or bruised and only used for bulk oil. The harvested olives need to be processed promptly within 72 hours of being picked. Most of the Tienda olive oils were processed the same day. First, large blowers remove leaves and twigs. Then, if it is to be blended oil, different varieties of olives are mixed together (in contrast to single fruit oil). Next, the olives with their pits intact are ground to a paste by granite rollers, or by a worm gear mechanism.